With its maze of flourishing lines and sparkling iridescence, the Stardust flush mount is a stunning sight to behold. 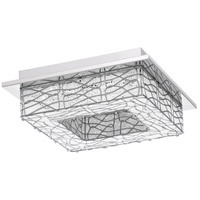 The square cube of the fixture features crossing and intersecting lines of metal over a glittering crystal shade. The polished chrome finish of the flat base provides the perfect mirror to reflect every facet and shimmer.